Visiting the dentist is one task that many people do not look forward to, yet most patients leave feeling cleaner and healthier. Part of your regular dental exam will include cleaning services to protect your smile for the long haul. Concord Smile is proud to serve as your family dentist for everyone’s oral needs, ranging from braces to dental fillings and more. As Concord’s general dentistry experts, we’re here to offer any and all services needed to keep your oral health as optimal as possible. One service that confuses a number of patients is our dental deep cleaning. This specialized task aims to promote optimal gum health, laying the groundwork for long-term success. Today, we’ll compare the difference between regular and deep cleaning services. When done, be sure to reach out to Concord Smile for an appointment to have your smile looked at. Contact your local dentist to get started! To start, regular dental cleanings are an essential part of your oral health plan. This service focuses on the surface areas of your teeth, working to rid the mouth of plaque, calculus, and debris at or higher than your gum line. Our dentists will work to provide a comprehensive cleaning for your smile, removing these harmful agents to create a positive aesthetic. We will also polish your teeth when finished to both protect you from cavities and provide a shinier smile. Regular cleanings pave the way for clean outcomes until your exam next year. While the surface areas look great, the real concern lies beneath the surface. The name of this service should provide a clue into what it is. Deep cleanings are more intensive, focusing on the bacteria that builds up beneath your gum line. 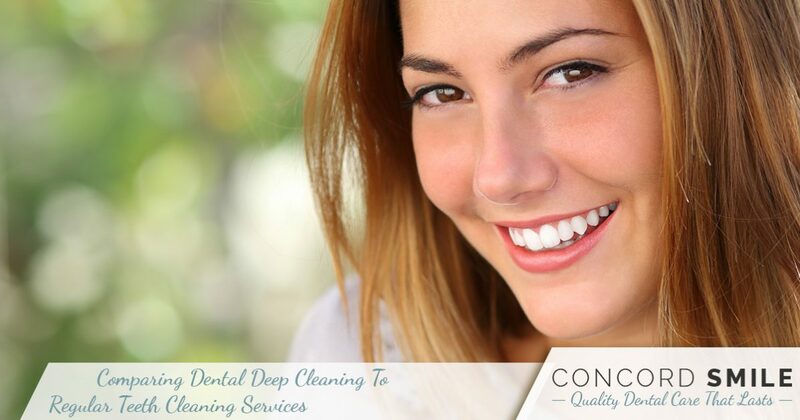 Also known as scaling or root planing, our deep cleaning services aim to remove the buildup of plaque and tartar below your gum line. These materials create the perfect breeding ground for harmful bacteria. The more ideal the conditions, the more invasive the problems can be. Eventually, the toxins from these bacteria can flow into your bloodstream, causing inflammation to the gums and bone. When left untreated, your bacterial problems can lead to gum disease, often referred to as Periodontitis. This chronic infection can be diagnosed when inflammation, bleeding, and gum withdrawal are present. Eventually, Periodontitis will progress to tooth loss, which can result in a number of other complications. While procrastinating gum treatment can prove to be very harmful, seeking medical help now can help to make you feel better. One immediate difference will come over the first couple of days after your deep dental cleaning, as the removal of plaque and tartar will help your mouth to feel cleaner. Defending from Periodontitis will help your body to better defend against illness and infection, reducing inflammation in the process to make you feel better overall. Patients rarely know how much their gum conditions affect their overall health until after our deep cleaning services. Concord Smile is here to provide a comprehensive approach to your oral health, ranging from screenings to tooth extraction procedures. Deep dental cleanings are an important step in fighting against gum disease, making this service one that is necessary for many patients. As expert providers of Concord general dentistry to our local patients, we’re confident that we can help you regain your beautiful smile. If you have issues with painful, swollen gums, be sure to contact our office today for an appointment!